Christmas is not complete without a spicy cookie. Oh were you thinking the gingerbread man? Forget about him. A bite out of this allspice chocolate cookie is all it takes to try something different this year. Enza (Maria's Sister) lead me through the wide selection of cookies at the store but she saved the best for last. Totos are a traditional Italian Christmas cookie and are perfect for the holiday season.This cookie is frosted with chocolate icing which complements the strong and fragrant allspice. Bite size with a cake-like center, it is easy to forget how many you’ve popped into your mouth, don’t forget to leave some for Santa! A cookie that is guaranteed to surprise Santa’s taste buds, this cookie is packed with pecans, coconut shavings, chocolate and oats. Although not particularly sweet, the perfect amount of sweetness comes from the big chunks of chopped chocolate. The coconut adds a surprising texture and a tropical feel while the batter is still moist and buttery. Over all this is a non-traditional cookie with great complementary flavors that Santa should enjoy. Just like little snowballs, these fluffy and light almond based cookies are tossed in confectioners sugar, to the point where they look like small white sugar coated balls. The icing sugar is what makes biting into the cookies reminiscent of licking a snowball--with a slightly cool touch when the icing melts on your tongue. The cookie itself is soft and crumbly, which makes it almost impossible to eat without making a mess. Leave this out and you’ll probably find a trail of powdered sugar and crumbles leading to the chimney. We have all experienced the joys of eating a peanut butter cookie, but what happens when real peanuts are added to the batter? The nutty, salty, slightly chewy and moist center is exactly what you expect to find in a peanut butter cookie, but the extra chunks of peanuts add a crunch to every bite. Yet, the cookie is still soft, buttery and densely packed with peanut butter; it falls apart in your mouth. For those guilty of eating peanut butter out of a tub, this might be a classier way to indulge. Like a delicate snowflake, these thin honey and almond based cookies are sticky, delicate, nutty and crispy treats. The best part is that the whit chocolate they are dipped in adds a creaminess to the toffee-like treat. A great caramelized and light treat for Santa. If Santa likes marzipan, this cookie would be a winner. 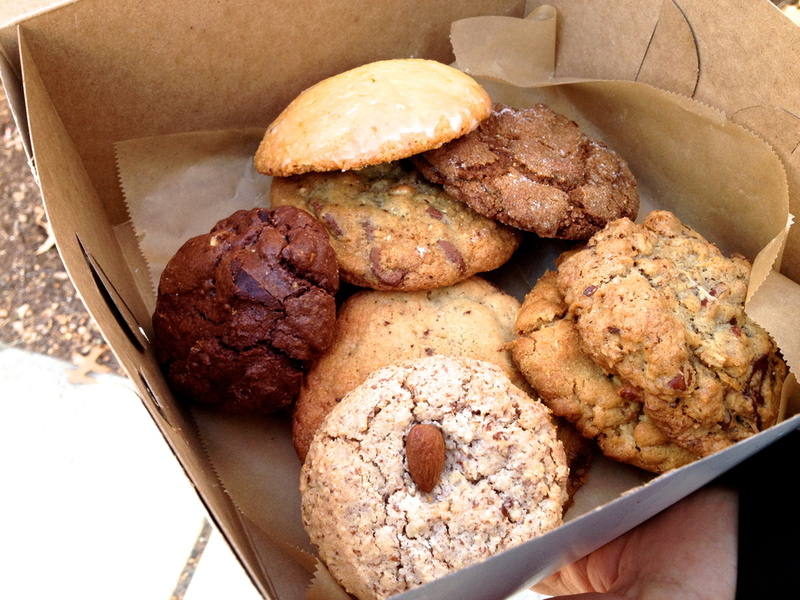 Flour Bakery Café puts a spin on the classic and elegant French dessert. Unlike the typical colorful and petite treat, this cookie-shaped Macaron is soft, sticky, chewy and nutty all at the same time. It is technically a Macaron because of its almond-based batter--which consists of powdered and grounded almonds--but the slightly grainy texture is not what you typically get from Macarons. Certain aspects make this cookie unique, while the smooth and glazed cream-colored surface keeps the dessert simple and modest. Warning: these macaroons are incredibly sweet- they might leave Santa with a sugar high. A popular Italian Christmas treat, the Pizelle is a delicate, thin and crispy waffle cookie that is pretty enough to be hung as a tree ornament. Now that’s an idea! The Christmas Pizelle I found at Bova’s Bakery were dipped in chocolate and topped with red and green sprinkles and crushed peppermint candy canes--peppermint and Chocolate, the perfect Christmas flavor combination. This not-so-ordinary chocolate chip cookie will change your ideals of what the perfect cookie should be. You get the expected crispy edges and the sometimes-rare extremely soft and moist center; but what it comes down to is the chocolate chips, or should I say chocolate nuggets. Rich milk chocolate blocks are all it takes to never again settle for a cookie with meager amounts of chocolate. The hazelnut elevates this new experience with a crunch. Spoil Santa with this cookie, he deserves it! A safe cookie to leave out for Santa would be this classic butter cookies. But dont look past these simple Christmas staples. Maria’s Pastry makes them crisp yet soft. They are the typical buttery and light cookie that you expect every Christmas season. The variety Christmas cutouts and colorful sugar sprinkles are all it takes to inspire holiday spirit. This one is for the chocoholics out there:a cocoa based cookie with a brownie-like center and blocks of milk and dark chocolate. Surprisingly, this cookie was not as sweet as I expected. The robust flavor of the chocolate comes through in the slight bitterness of the dark chocolate pieces and the subtle sweetness comes from the chopped milk chocolates. Dense and satisfying, this everything-chocolate cookie is probably all Santa wants for Christmas this year. Although less festive, these are great for the season because they are “a perfect dunking cookie,” says Dominic, from Bova’s Bakery. This tough cookie will make a perfect companion to your seasonal hot chocolate. 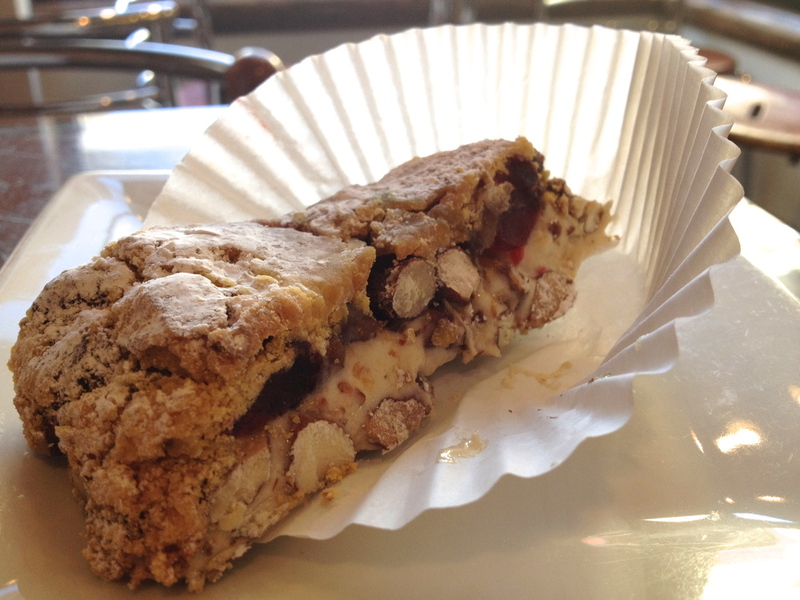 Try the chocolate almond biscotti. It is a slightly bitter and sweet biscotti, but also subtly delicious. Dunk it into hot chocolate and watch the cookie absorb your drink and turn soft and spongy. A delicious Holiday special offered at Modern Pastry, this treat features honey, almond nougat, soft cookie, figs, dried fruit and nuts--you name it, all the Christmas flavors are represented here. When dissecting this cookie, the first layer is a soft cookie topped with chopped almonds and sticky nougat (with a marshmallowy texture); next is another layer with big whole almonds and dried figs--these adds yet another, fruity, dimension to the cookie. Modern pastry only makes this holiday special this time of year so make sure to try it while it’s in season. These are strictly for licorice lovers only! Although they are white and glazed with a light and sweet vanilla frosting and sprinkled with colorful confetti, don’t be fooled by these pretty little things. The waft of licorice from the cookies does not come close to the strong punch that you get with the first bite. Bova’s also sells the cookies in a lemon flavor. Regardless of which one you choose, make sure Santa has a jug of milk to wash down this one. Flour Bakery+Café *See locations and phone numbers on website.